These are delicious lettuce wraps from my Australian Women's Weekly Chinese Cooking Class Cookbook (my bible for Chinese recipes). Cover mushrooms with boiling water, stand 30 minutes, drain, remove stems, and chop mushrooms finely. Chop water chestnuts and bamboo shoots finely. Drain and flake crab. Chop shallots finely. Heat oil in pan or wok, add pork, toss until dark golden brown. Add mushrooms, water chestnuts, bamboo shoots, crab and shallots, toss well, cook one minute. Combine sesame oil, soya sauce, oyster sauce and sherry, add to pan, toss until well combined, remove from heat. Put heaped tablespoons of pork mixture (this may vary according to the size of the lettuce leaves), into the centre of each lettuce leaf. 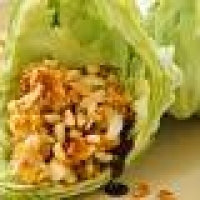 Fold in the ends and sides of lettuce leaves as shown and roll up to form a neat parcel. Generally the meat filling and lettuce leaves are served separately so that guests can fill and roll their own. Makes 8 wraps.